This painting by Norman Rockwell, Willie Gillis New Year's Eve, appeared on the cover of The Saturday Evening Post published January 1, 1944. This is yet another timeless favorite of Rockwell collectors, a classic for the ages. This painting was Rockwell's first cover for The Post in 1944. In 1944, there were nine Norman Rockwell Saturday Evening Post covers published. This painting was also Rockwell's 218th overall of 322 total pictures featured on the cover of The Post. Rockwell's career with the Post spanned 47 years, from his first cover illustration, Boy With Baby Carriage in 1916 to his last, Portrait of John F. Kennedy, in 1963. This is also the ninth in the Norman Rockwell Willie Gillis series of covers for The Saturday Evening Post. 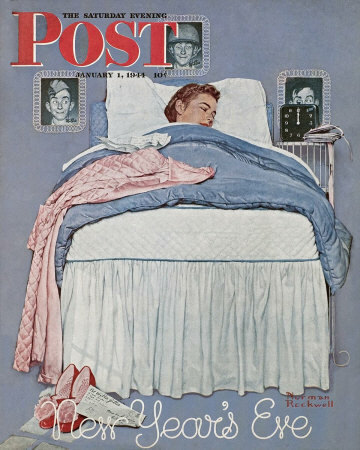 Rockwell painted eleven images that appeared on the Post cover and one illustration that was featured inside the Post. The whereabouts of the original oil on canvas painting is currently unknown. on page 154 of Norman Rockwell, A Definitive Catalogue by Laurie Norton Moffatt. I have seen pristine original copies of this magazine cover sell for over one hundred dollars on eBay. And to think it only cost five cents originally! And it was mint condition at that time, too. This classic Norman Rockwell painting shows the girlfriend of Willie Gillis, America's boy next door, at home asleep on New Year's Eve. The girlfriend is being the faithful stay-at-home sweetheart. She is being portrayed by Rockwell as the girl all American Servicemen wish they had waiting at home for them. We can tell she has stayed at home this New Year's Eve, because we can see her pink housecoat neatly laid across the blue comforter on her bed. The model for Willie's girlfriend is the daughter of fellow illustrator and artist, Mead Schaeffer. Her first name is Patty. Patty appears in two of the paintings of the Willie Gillis series, this one and Girls With Letters. She also appears in the painting Christmas Homecoming. Rockwell uses a story telling device in this painting to actually get Willie Gillis into the picture. The young lady's bedroom features three black and white photographs of Willie on its wall. All three are on the wall behind the bed. Willie Gillis New Year's Eve was only one of 322 Norman Rockwell Saturday Evening Post covers; Here is the list of Norman Rockwell Saturday Evening Post cover illustrations. One photo shows Willie wearing his soldier cap. One shows him with his helmet on. The third shows him with nothing on his head, allowing Rockwell to paint the lock of hair that model Bob Buck usually had draped on his forehead. Willie's eyes in all three photos are looking at the object of his affections. In one, it looks like he is even peeking over the alarm clock on her night stand. Another device we can observe is the letter from Willie she has been reading in bed before drifting off to sleep. This is further reinforced by the envelope on the floor. The envelope bears the return address of Willie Gillis, with an APO address.